It would not be Christmas without pastry. Pastry enables the wondrous things like mince pies to take place and where would we be without mince pies? Todays recipe os how to make this traditional favourite in a more traditional, healthy way, using spelt flour and animal fat, both of which are much better alternative to white refined flour and vegetable oil! So I shall hand over to Jessica who will share her tops tips (isn’t she awesome?)! Pastry is not a complicated beast. Plus the taste difference from a shop brought mince pie/apple pie and a homemade one is huge! I dunno what the shops do to make the bases of their version, but it ain’t pastry! Pastry is a wonderous thing you can make with flour water and butter/lard. Its cheap, can turn leftovers in fantastic pies and puds and in its natural form is brilliant, nutritious and full of good fats. Follow some simple advice and your shortcrust pastry will be the talk of the family. Be WARNED your family will NEVER let you buy fakey pastry pies AGAIN. Its a cross I have to bear. I have found Spelt Flour (a traditional, unprocessed, easily digestible and natural flour perfect if you have no gluten or wheat sensitivities) makes really good pastry for sweet or savoury dishes and is available in most big supermarkets. Wholemeal flour also works well but I prefer to stick it in savoury recipes as it does have added bite. 2) Cold hands, cold kitchen, ice cold water. Keeps the butter hard and a bigger change of temperature in the oven which is what makes it crisp and melt in the mouth…..mmmmm. 3) Don’t bother with Sugar. It make no difference to taste in the end and makes the pastry difficult to work. If your filling is sweet you don’t need sugar in the base too and if the filling is savoury sweet pastry would just be weird. 4) Handle with care. Handle as little as you can get away with. Spelt and wholemeal will need more of a gentle knead than white flour because of the lower gluten content (kneading activates the gluten) but be careful overworked pastry becomes very hard and cardboardy. 5) Chill in fridge (if you can) before rolling. 6) Roll out, fill and Oven FAST, to keep the pastry cold. Right I need to go and make 60 mince pies…..Told you pastry perfection was dangerous…. Just to prove to you that Spelt Flour flour is the perfect bleached flour alternative (and won’t have you family thinking you have turned into some ‘hippy baker’) just look at the picture below. 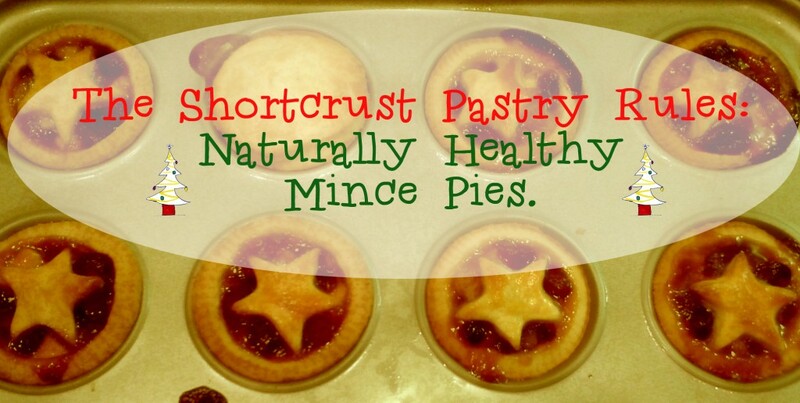 Which ones are spelt mince pies and which are made with normal white flour? Can you tell? I (Kezia) can’t either!! Which is made with spelt and which is normal white flour? 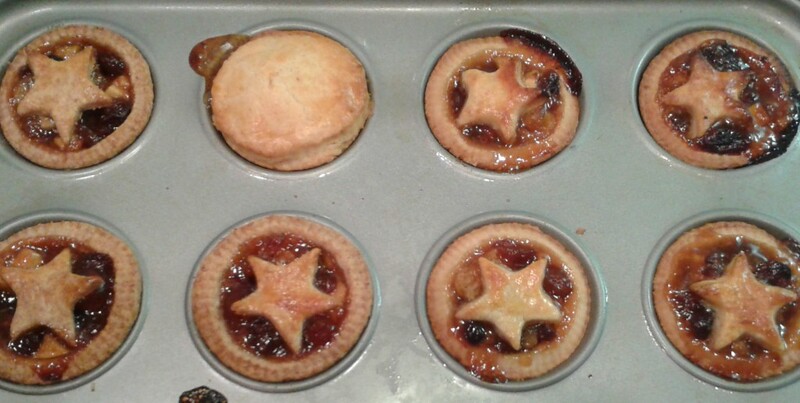 For mince pies use my mincemeat filling and cut the pastry into circles and top with star or circle shaped bits of pastry. Brush with a bit of beaten egg and cook for 20 mins. A natural twist on the traditional shortcrust pastry using spelt flour. Mincemeat or filling of choice. Rub the fat into the flour using the tips of your fingers till it looks like bread crumbs. SLOWLY add in the water mixing with a knife till it starts to lump together large lumps. Turn out onto a lightly floured surface and bring it together to form a smooth dough . Roll out, cut and fill with what ever your desire. Cook at 180c until the pastry is evenly brown. Before cooking brush some beaten egg on top of you pastry creations and keep and eye on them in the oven. Mince pies normally take around 20 mins to cook at 180c.